International networking meetings realized in the frames of Cross-Baltic Upgrade2018! initiative in Lithuania, Vilnius 26-27 September and Riga, Latvia 1 October engaged in active dialogue leading figures of art and society from Lithuania, Latvia, Russia, Estonia, Finland, Poland and Belarus. Promoting cultural diversity as well as European cultural heritage provoked multifaceted discussions among the participants, representing writers, journalists, directors of theatres and museums as well as politicians and ambassadors, a press release from Creative Association for Arts and Culture DROM states. "Upgrade 2018!" is an international cooperation initiative by renowned Finnish author and artist Mr Veijo Baltzar, coordinated by Creative Association for Arts and Culture DROM and co- financed by Nordic Cultural Point. The project is dedicated to promotion of Intercultural Dialogue in the Baltic region and building sustainable multicultural society based on common analysis of the course of society and international cultural cooperation. 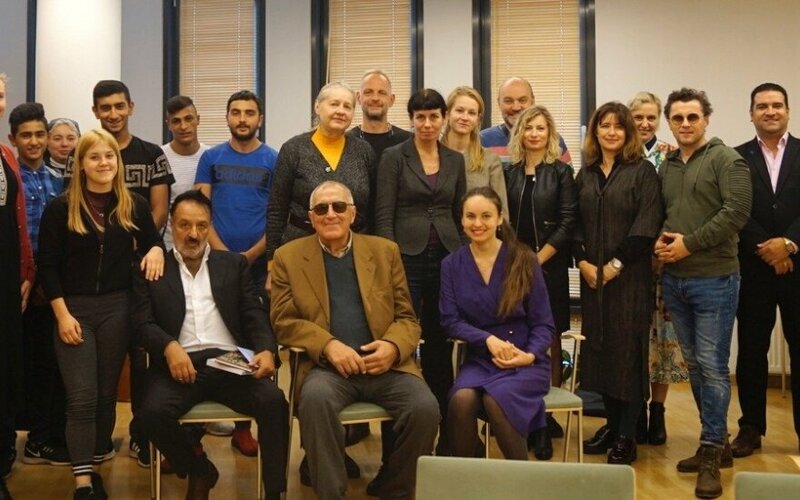 As a result of Upgrade2018!- meetings was born an international cultural cooperation strategy of the Baltic region, discussed and built on the basis of 20 cross-disciplinary law initiatives by Cultural Counsellor Veijo Baltzar for renewing EU's policies of multiculturalism, introduced and discussed during the meetings. The project comprised three events, Upgrade2018! seminars in Riga, Latvia 28-29 May at the House of European Parliament and the Embassy of Finland in Vilnius, Lithuania 26-27 September 2018. Ambassador of Finland in Latvia, Riga Ms Riitta Korpivaara hosted a Finnish-Latvian networking and follow-up meeting on 1 Oct 2018, involving cultural and academic leaders of Latvia. Upgrade2018!-meeting in Vilnius discussed the position and the complexity of the issues of multiculturality and culture in today's society: participants were unanimous that not all current trends are positive and that their problematic spots and causes of problems should be tackled much more thoroughly, and that this process should involve more actively the leaders of arts and culture. "Nowaday's life is based on commercial values, not spiritual ones. Such issues, as spirit, talent, human contribution to culture are devalued, and the society is built on entirely different principles. And it is remarkable that Veijo Baltzar, possessing both spirituality and talent, as well as being a successful entrepreneur, proposes to implement reforms that he really understands and can put a contribution to the problems' solution. Writers judge life not by dogma, but by feelings, they find in life the most vivid, the most worthy, and this is the most right way to build a fair and talented society." "Disappearing of emotional intelligence is a serious threat to humanity. Without emotional intelligence societal trends are hollow and empty. They pursue only temporary benefit, and during the next generations they will already turn negative, producing negations to mankind and nature. However, initiative Upgrade2018! has indicated that we can still witness high spiritual resources and state of will in our societies". The participants of the Upgrade2018 meetings regarded Baltzar's law initiatives, based on principles of equality bound to democracy, as representing a new era seeking a place for itself in new modern Europe. The initiatives were considered important particularly because of their provocative and challenging nature, questioning customary conventions and outmoded ways of thinking. Participants of the meeting in Riga on 1 Oct expressed their worry about the world entering the state of a new "cold war". Baltzar's initiatives were considered as important attempt to act as preventing counterforce to this development. Among the societal phenomena of modern Europe, adduced by participants of the meetings was also the lack of authority among cultural leaders and artists in relation to political decision-making, and the great need of changing the situation. "We all know that during the first half of the 20th century decision-makers listened very carefully to opinions of authors and artists. However, this is not the case in modern Europe. The most important cause of this is, in my opinion, the commercialization of the arts. What should be done to restore the authority of art professionals and leaders in relation to politics, is a very complex question! And it is very valuable that Mr Baltzar has set this task to himself. I think, his attempts are crucially important." "Implementing the initiatives by Mr Baltzar would signify a revolution. It would mean turning things upside down: starting from culture and not economy. The question is about the power and revolution of the heart". Fragmentation as a consequence of globalisation worried: "Similarly to small nations and states, individuals have been left alone. Forums like this are very important." In Riga, on 1 Oct 2018, representatives of Latvian Academy of Science were fazed with Baltzar's statements and challenges, but found new perspectives to the issue discussed. "I agree that fragmentation of multiculturality and its related discourse is not appropriate: it leads to disappearance of essential meanings." Upgrade2018! discussions in Riga and Vilnius emphasized the importance of activity on the level of citizens and cultural professionals in defending issues of identities, future of the nations and cultural heritage. "Being locally active and promoting our interests and needs towards Brussels and EU is of ultimate importance". "According to Pope Francis: 'Christians are able to affect matters to increasingly lesser extent, because isolationism and individual logic are being spread – but we must oppose this, we cannot let fear taking over us'. These words of the leader of Catholic church have a direct relation with the role of culture in today's society and strengthening humanistic values in rapidly changing world, in which the change is not always going to a better direction. Undoubtedly, Veijo Baltzar's initiatives need to be given their full implementation on a pan-European level." All Upgrade2018! meetings in Latvia and Lithuania led to strategy of collaboration, that will be soon publicized. Initiatives include future collaboration in the field of international literature exchange, theatre collaboration as well as organization of conceptual and strategic conferences in 2019 in Finland and Estonia, involving leading figures from creative fields of the Baltic-Nordic region, tackling the issues of European societies and their development. Participants of Upgrade2018! meetings emphasized the importance of promoting and providing space for intellectual dialogue and discussions to take place in Europe – an element that has been neglected and ostracised by systems of power and rule. One of the proposed activities and objectives is a formation of a European-level institution bound to societal structures, under the slogan "Many languages, many arts – one Europe". Follow the results of Upgrade2018! - and the project report soon to be published - at www.en.drom.fi/upgrade2018.